St. Vitus Cathedral, by Prague Castle. 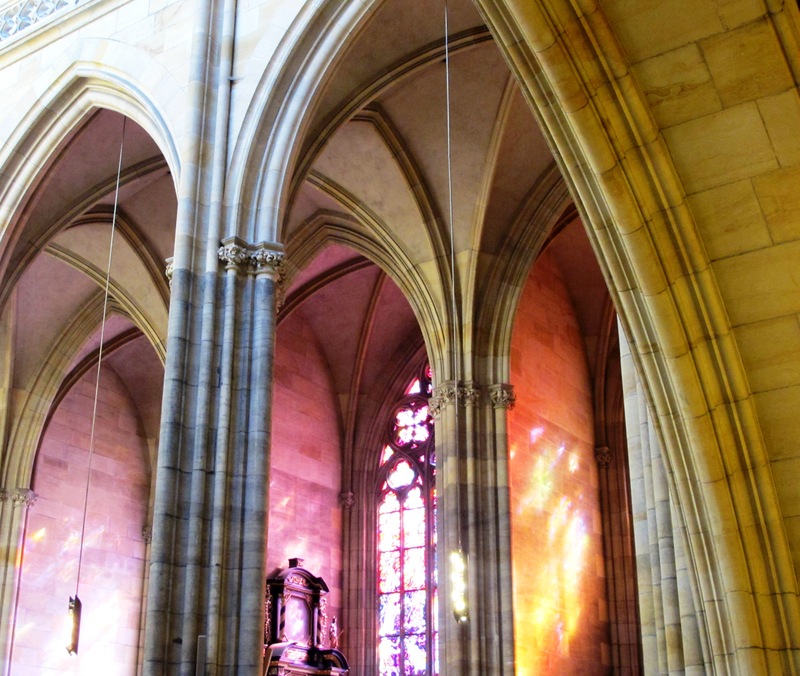 Isn't the filtered light through the stained glass windows wonderful? Days of eating our way through Europe had finally caught up with us. We’d been wined and dined across Slovakia, filling ourselves with Golden Pheasant beer, my great aunt Dada’s apple strudel and plum dumplings, halusky, salty korbáčiky cheese and mile high pieces of zemlovka, a savory cake baked with layers of custard-like french toast, tvorah cheese, meringue and blueberry jam (recipe on its way soon). We’d eaten like royalty and were now suffering the consequences. Our destination was the Prague Castle and St Vitus Cathedral in the far distant background. 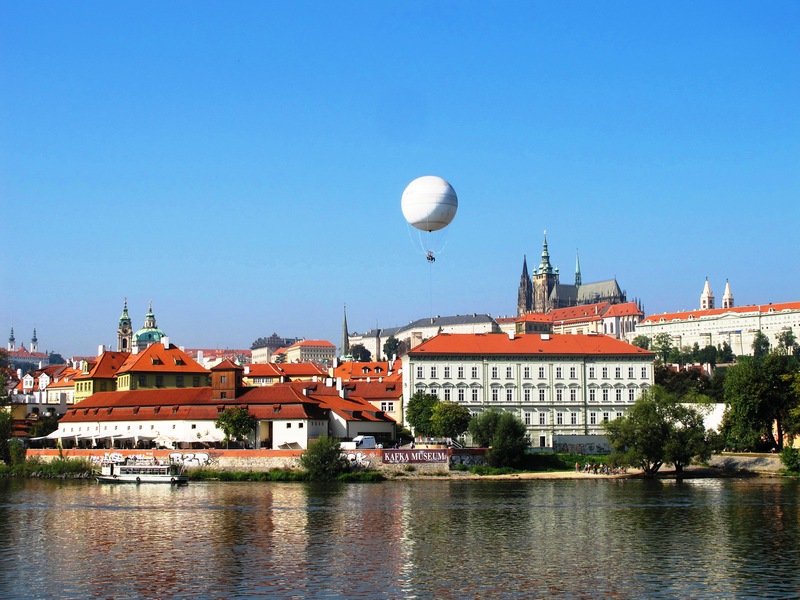 Our destination on this warm fall day was the Prague Castle, across the Charles Bridge and up a few hundred steps. The five of us began trudging up the endless steps and I soon lagged behind, a teensy bit out of breath. “Go ahead”, I urged the others as I stopped to rest take pictures. I claimed the burden of my small black clutch purse was too heavy to carry, blaming the weight on a newly purchased t shirt my husband had jammed into it. I had been feeling a bit peckish, and so grudgingly my betrothed walked back down to me and took the dainty purse as we kidded him about the security of his manhood. I stopped here along the steps up to the castle strictly to conduct research for the blog, examining the crepes and trdelnik being made. 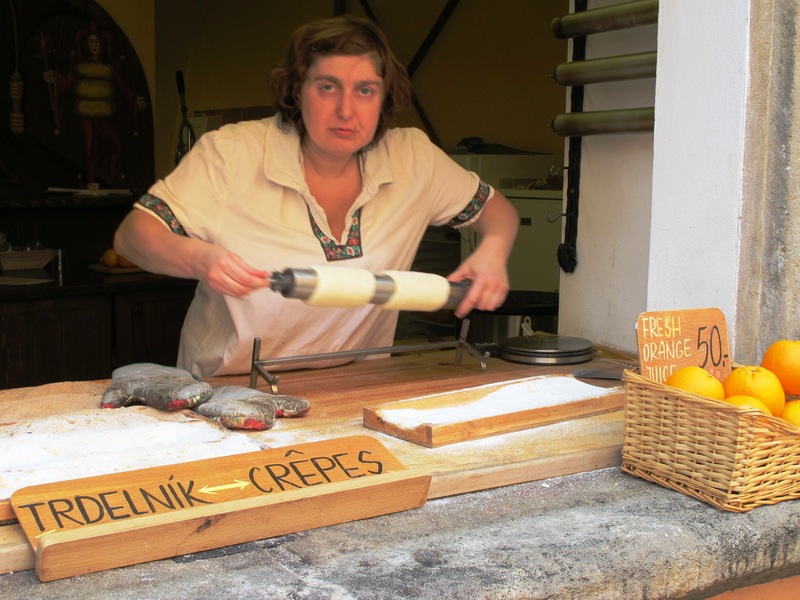 I resisted the temptation to taste the trdelnik, a sweet, crispy Slovak treat often sold at fairs and the like. My cousin Martinka encouraged us along by telling us about the magnificent sites to be seen from the top. After an interminable number of minutes of huffing and puffing, we reached the summit. And there at the top of the hill, lined against the wall in all their glowing natural beauty, were 42 young, nubile women dressed in evening gowns, sashes swathed across their chests. 42 girls from around the world ages 16-23 vying for the crown of Princess of the World. Ms. Mexico, the one on the far right in the black dress, won the dubious title this past weekend. The girls completely blocked our view. We stood there, breathless, and took in the spectacular views. Of Martinka’s city of course, spread out before us over the stone wall. At least I tried to see Prague, but the view was largely blocked by these young women three feet in front of us who had obviously NOT been eating like royalty lately. 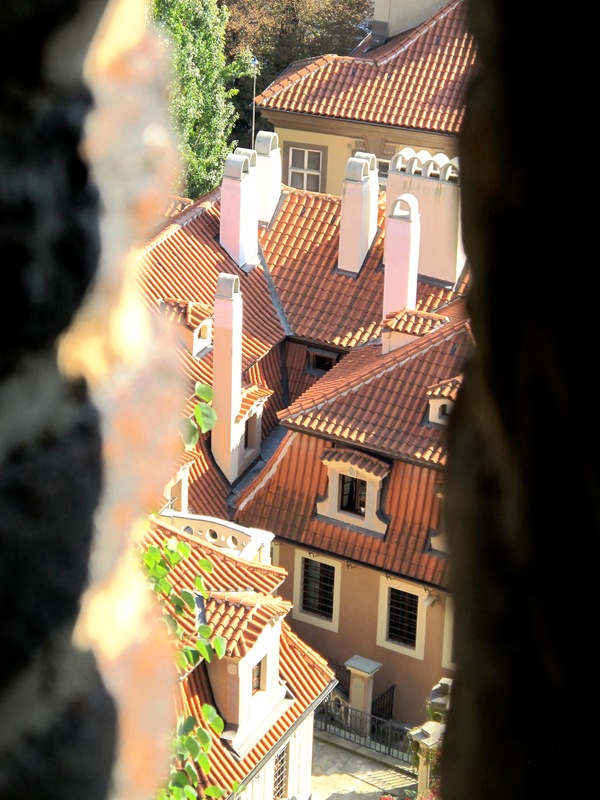 The view from the top of the hill by the castle, through a slit in the stone bricks. We want photographs of more food not candy. That is a hilarious story… Not sure what you are most upset about, your physical state or inability to see the view after that climb? Amazing colour in St. Vitus photograph. Ha ha. I want my cake and to be able to eat it too! Alas, I’ve sworn off food for the next 3 months. Keeping up Pauline’s Cookbook has taken it’s toll on my waistline. We saw nothing like that when we went to Prague Castle – probably just as well since it looks enough to make any woman feel inferior! Yes, it spurred me on to severely diet! Everybody else says the tram is simple but we got a bit lost about the initial day so gave up and walked everywhere. The actions up to Prague Castle were a killer but it was so worth it for the view from the top. Another few hundred steps led us up a very narrow spiral stairway up ti the best of the cathedrals tower.